This 408-acre family-run estate on the shores of Lake Rousseau in the Muskoka Lakes District has diverted family vacationers since 1883. The original hotel, with its mansard roof and octagonal tower, was designed to resemble a ship since many of its early guests arrived by steamship. Later expansion, however, added cottages and beach bungalows and the resort can now accommodate up to 475 guests. Tennis has long been a central amenity. There are 16 hard courts (2 with lights) and a program of activities under the resident pros. Beyond that, the resort has a 9-hole golf course, a beach, 4 outdoor heated swimming pools, 4 hot tubs, shuffleboard, badminton, and basketball courts, a baseball diamond and soccer pitch, a beach volleyball court, boat rentals and cruises, a professional waterski school, and a equipped fitness facility with sauna. During the busy summer months the recreation department schedules scores of events each week. Moreover, there is an extremely well-run children's program, with 55 counselors providing everything from babysitting and nursery services to free 9-hour-a-day activities and sports camps for kids ages 3 to 11 and for teens. Finally, there is live entertainment every evening. Tennis Staff. Gary Ingram heads the tennis staff, bringing to the position more than 25 years experience as a player, coach, and teacher, some of that internationally. Tennis Programs.As I hinted above, this is a very active program, both for chilodren and adults. During a typical week there are daily clinics, evening clinics, Cardio tennis sessions, as many as 4 social round robins, and a doubles exhibition. Those are supplemented by themed socials, special tennis camps (including a ladies retreat), weekend book camps, and occasional special events. In addition, there are full week, 3-hour-a-day junior camps every week from early July to the end of August. Courts & Fees. 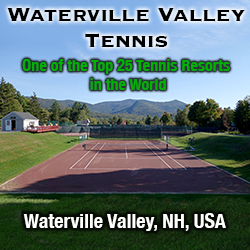 16 hard courts, none far from the lake. There are 26 rooms in the original hotel, while the rest are scattered through various lodges, bungalows, and cottages. Those cottages range in size up to three bedrooms and may have outside decks overlooking the lake and fireplaces. Many packages available for multi-night stays; early and late season discounts offered. Seasons. Summer and early fall for tennis. So far, I haven't received any written feedback on Clevelands House. If you've taken a tennis vacation there, I'd like to hear your reactions.